My mom really likes popcorn. And I mean really likes popcorn. For as long as I can remember, we’ve had tubs of kernels stocked our pantry as well as those microwaveable packets. Heck, we occasionally even have bagged cheesy popcorn around the house. And who didn’t have a tin can filled with candied popcorn around the holidays? 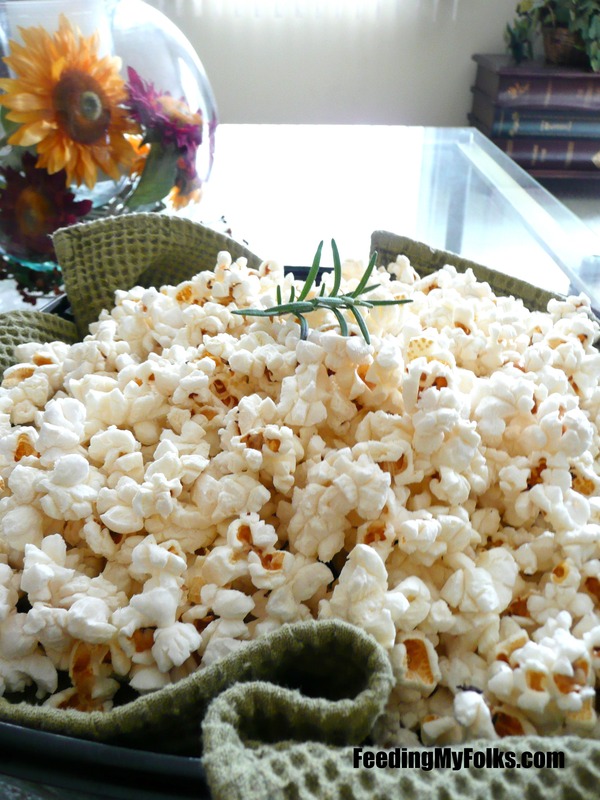 In short, popcorn is always in our house, so I like to play with flavors so it won’t get boring…like this recipe, which I ripped directly from the great Giada De Laurentiis (one of my favorite people on the Food Network). When I first saw Giada make this popcorn on TV, I knew I’d be making immediately. It’s so simple and such a unique combination of flavors. 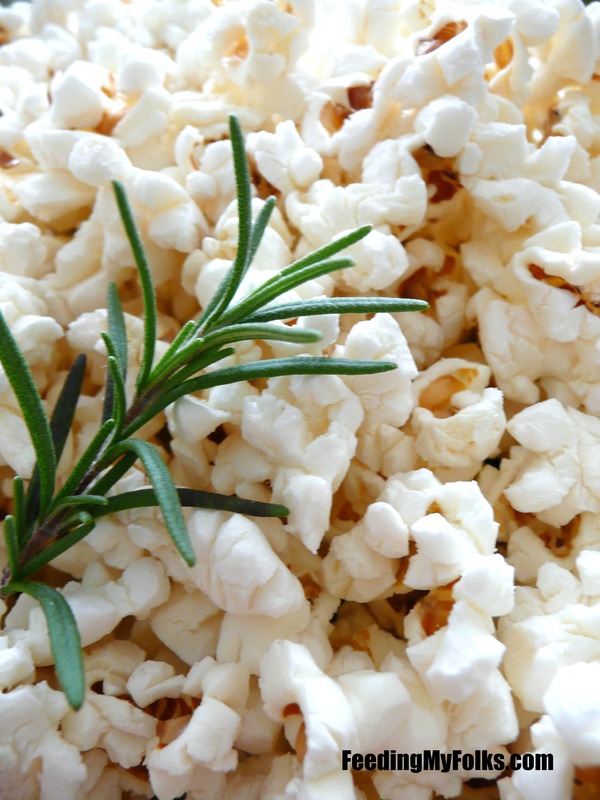 I mean, pairing popcorn with something as “fancy” and floral as rosemary? Genius! And my god does it taste great! It’s incredibly light, with a comforting airy crispness that keeps you munching until there’s none left. Each handful has an earthy, floral bite from the rosemary…you’ll be addicted. Good thing it’s simple to make, because you can whip up another batch in no time (totally speaking from experience here haha). I usually don’t jack other people’s recipes, but I know you guys will enjoy it, so I wanted to pass it along! Combine oil and rosemary in a small saucepan. Warm over medium-low heat for roughly 5 minutes. Remove from heat and cool to room temperature. In a large pot over medium heat, add 1/2 of oil and 1 cup popcorn kernels. Cover (with lid slightly cracked) until the kernels have popped (about 3 minutes). Put warm popcorn into a large serving bowl and toss with 2 tablespoons of the oil. Sprinkle with your desired amount of salt and enjoy! This sounds super easy to make! I’ve never popped my own popcorn (aside from the microwave) so this is something I definitely want to try. I actually recently read that the lining of microwavable popcorn bags contain chemicals that, if too much is consumed, can cause infertility. SO NO MORE.